SPECTRE plans an intricate scheme to lure James Bond into stealing a valuable Soviet decoding machine, and unknowingly deliver it into their hands. In the process, Agent 007 is to suffer a humiliating and disgraceful death. SPECTRE island; London, UK; Istanbul, Turkey; Belgrade, Zagreb; Trieste, Yugoslavia; Venice, Italy. James Bond is being stalked through a hedge maze. Taken by surprise he is ambushed and strangled with wire from the assailant's watch. The area is lit up with lights; it's a training exercise for an organisation that we don't yet know about. The man who supposedly is Bond is just a training victim in a mask. he title is first heard when the song plays on the radio, but Bond use the phrase later when Moneypenny hands him a photo of Tatiana. 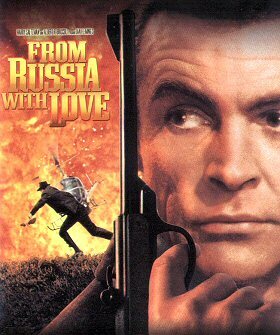 007 writes "From Russia With Love" on the photo before leaving for Istanbul. 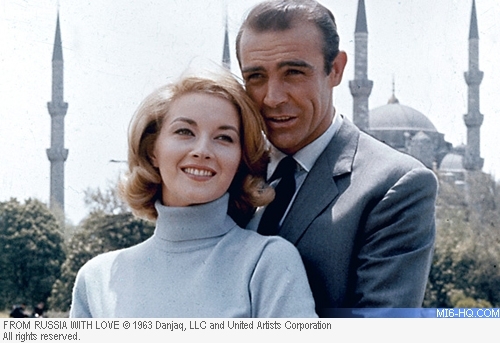 Bond: "Red wine with fish. Well, that should have told me something." The noise in the SPECTRE training camp doesn't start until Rosa Klebb gets there. The hands of Ernst Stavro Blofeld (Anthony Dawson) and his Persian cat appear for the first time. A scene featuring Kerim Bey delaying a Bulgarian from following Bond by explaining the facts of life was cut when it was discovered the character had been killed off in an earlier scene. The original cinema release was cut to receive an "A" rating. The 1987 video release is mastered from this copy, but all other releases are uncut. Television versions differ in a few places. Russian dialogue is translated in subtitles on some video prints of the film, but not on some TV prints. Krilencu hitting the ground after being shot in the back and Tatiana walking to Bond's bed, naked, are cut from most TV versions. A 1990 Canadian television broadcast of the film cut the gypsy girl fight altogether. ABC in the USA during the 1970's cut the pre-credits sequence. Compared to the cinema prints of the 1970's and the first video issues, the end titles on present video and DVD prints are now longer and slightly different in content. The 2001 DVD release corrects the misspelling of Martine Beswick's name in the credits. JAMES BOND WILL RETURN IN THE NEXT IAN FLEMING THRILLER "GOLDFINGER"